This 19th century Maison de Maître was built by the Vicomte de Bellissens in 1858. The valley in which it is set has been inhabited for at least 900 years. It is set in a beautiful and secluded river valley in the foothills of the Ariège Pyrénées mountains, in southern France. 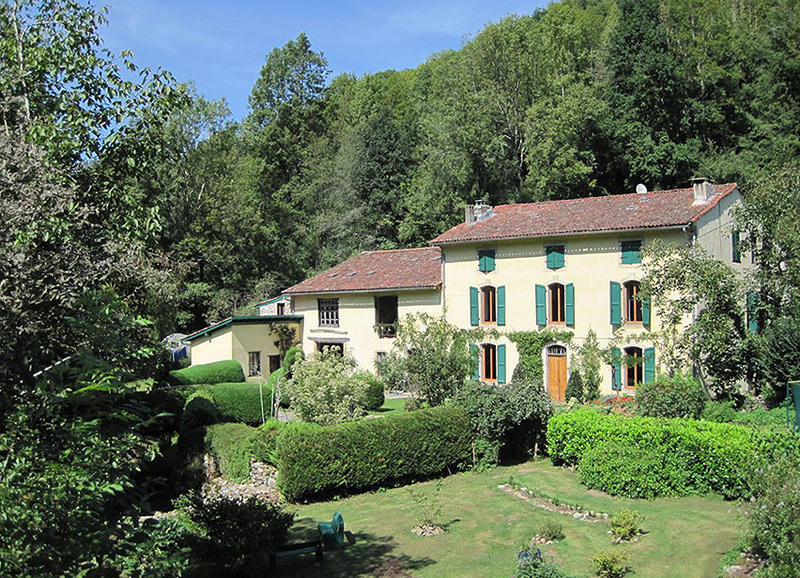 Extensive gardens and river frontage deep in the Bellissens Forest. Thousands of hectares of wild forest, rich in wild life including bears, lynx, Ibex, boar and deer. Tourné is much loved by countless people who have experienced profound change and joy during workshops, retreats or as a base for exploring the natural world. It is the home of our hosts Paula, and Ram who is co-facilitating the course, their son Jiva, and assorted cats, dogs and donkeys. Workshops and retreats have been held at Tourné since 2003, hosted by Ram and Paula and before that it served as a music school as well as a community for Gurdjieff work. The venue offers spacious accommodation in private or shared rooms with private bathrooms. Serving meals with a range of traditional French cuisine as well as vegetarian and oriental food, with most dietary requirements met, using locally sourced and organic food where possible. Tourné and the Artillac River are in the very centre of the Ariège Pyrénées national park. Tourné has substantial gardens, a large studio and workshop space, with outside seating areas and 1000m of private river frontage. The altitude of just under 500m allows you to enjoy exceptional air quality, warm sunshine with cool shade never far away. Numerous local activities include skiing, walking, lake bathing, cycling, parapente, horse riding, white water canoeing, historic sites. Flight options - easiest is Easyjet/British Airways/Ryanair to Toulouse. then a 1.20hr train ride to Foix. From Foix we can arrange a pick-up for last 25 min drive. Alternative is to hire a car in Toulouse, then 1.5hr drive. An alternative route is to fly to Carcassonne , then about a 1.5hr drive. Train also possible from Carcassonne, but not as easy as Toulouse. More precise travel details will be sent to those who book. In the meantime, have a look at the Tourne website for travel information. above: red roots of the Alder in the Artillac River at Tourné. The Alder tree signifies resurrection in theCeltic tradition.